Churchgoers Say They See Jesus in Photo of Fire at Church — What Do You See? 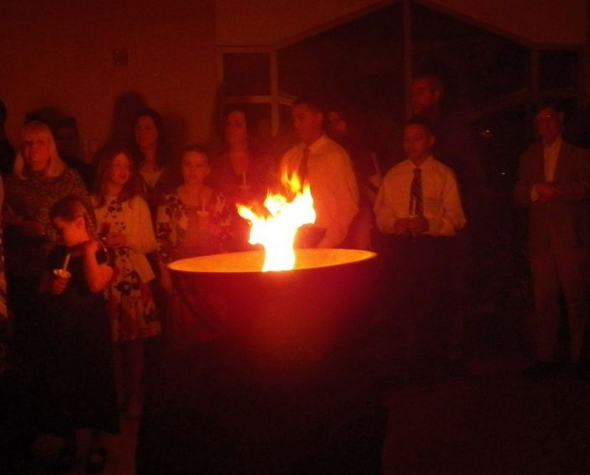 Moses found God in a burning bush, and some North Dakota churchgoers believe they saw an apparition of Jesus in the form of flame at an Easter Vigil mass in March. Amateur photographer Paulette Osborne captured the photo of the burning Easter candle at Holy Spirit Church in Fargo taking the shape of the a cloaked man on March 31, and, while she is cautious about using the term “apparition,” she admits to being wowed by the image. As Osborne explained, she began snapping pictures that the vigil mass after noticing a crowd of people gathering around the flame. She told KFGO that her series of pictures shows the fire growing from a small white dot to the roaring fire in her now-infamous photo. While she knew she had “pretty” shots, she didn’t know the power of what she had on her hands until a few days later when she was flipping through the film and couldn’t believe her eyes. Her fellow churchgoers agreed, and the Fargo Catholic Diocese even published the picture in its New Earth magazine. The caption acknowledges the photo’s likeness to the risen Christ but stops short of calling it an apparition. As KFGO reported, the diocese shared the photo because of its relevance to the celebration of Easter but does not claim the image is an apparition.